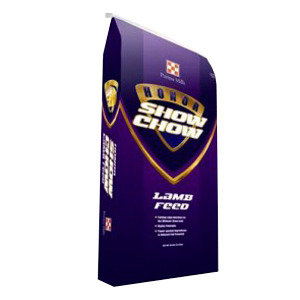 Honor Show Chow Grand Lamb Mixer DX concentrate is a blended supplement containing a nutritious pellet (containing soybean meal and linseed meal) and steam rolled barley that can be mixed with corn, oats and molasses to make “custom” high quality show lamb diets. This flexible feed allows you to adjust the grain level to fit your needs for breeding ewes, growing lambs or finishing lambs. Mix Honor® Show Chow® Grand Lamb Mixer DX 40.35 at 750 lb perton with other non-medicated ingredients to manufacture Honor® Show Chow® Showlamb Grower DX Textured, which contains 15.16 g decoquinate perton. (See below mixing directions.) Feed at least 28 days during periods of exposure to coccidiosis or when it is likely to be a hazard. Mix HONOR® SHOWCHOW® GRAND LAMB MIXER according to the following directions: Crude Protein.........................................................20%, 18%, 17% Honor® Show Chow® Grand Lamb Mixer...............950, 800, 700 Corn......................................................................750, 900, 700 Oats......................................................................200, 200, 500 Molasses...............................................................100, 100, 100 Total.....................................................................2000, 2000 2000 Deccox (grams/ton)................................................21.5, 18.1, 15.9 Caution: Do not use in feeds containing bentonite. Warning: Do not feed to sheep producing milk for food. Reminder: Feed is perishable and should be stored in a clean, dry, well-ventilated area so it willremain fresh and palatable. DO NOT feed moldy or insect infested feed to animals as it may cause illness, abortion or death. Fresh, clean water should be available at all times.